I was consciously running for the environment one Saturday in an organized fun run. Ironically the path we were traversing smelled really really filthy it was uncomfortable bordering to disgusting -to think that runners pant for breathes to stay alive. That side of Philcoa stinks. The former vice president who joined the event noted, too. Along with other 79,000 runners, my siblings and I joined the One Run, One Philippines. 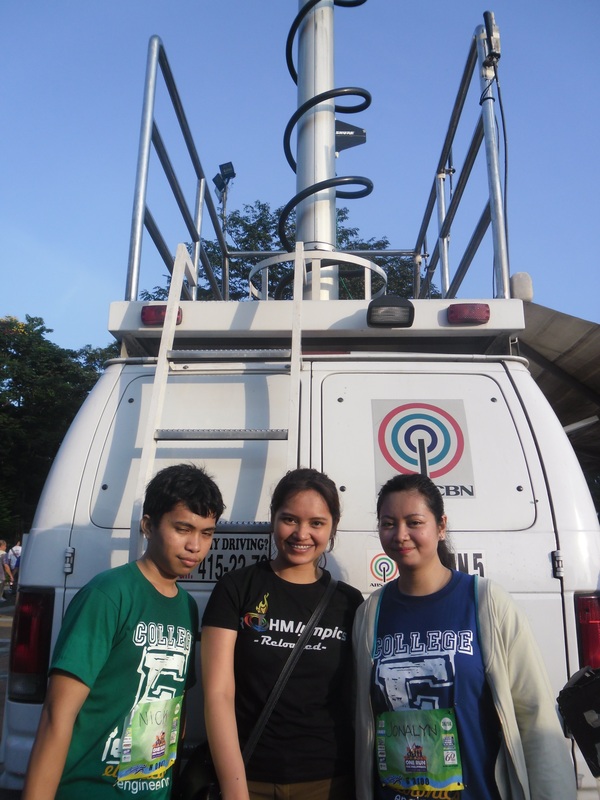 It was a part of Channel 2’s Kapamilya weekend. The funds for the run in Quezon Memorial Circle will go for the rehabilitation of Pasig River. There are other runs that were simultaneously held in other parts of the country and even in the United States for other environmental advocacies. The runners are grouped according to the organization, school or company they belong. I bet some schools were required to join. There are 10 clusters and individual runners like me and my brother who were assigned on Cluster 1 or 2. We tried to get to Cluster 1-nearest the starting line but because the crowd started assembly at 5:30AM, thirty minutes before we arrived at Philcoa, we couldn’t get through anymore.Cluster designations were emailed after the bib registration online. Some of Channel 2’s artists ran with the crowd. They were just escorted by soldiers or policemen. My brother ran side to side with me except for that portion when he blazed the trail to catch a glimpse of Anne Curtis. The arists were being consistently called by the crowd which they ignored. As for me, I was serious in gasping for my own breath while running and did not bother to take pictures of them. Like the snob male senior citizen quipped, “Ang mga artista sa tv na lang ‘yan. Dito takbo lang tayo.” (Celebrities are for the tv only, We’re here only to run). They were able to entertain the crowd, nevertheless. We have to admit, many folks just joined the cause to see their idols. I appreciate the actors’ effort to draw crowd. Their promotion and participation in that fun run of curse helped raise funds. We scouted the area around Quezon Memorial Circle where booths and bazaars are located. I was able to shop for some items. Bazaars are just so accessories haven! We had breakfast in an unprepared restaurant in the circle. Apparently, they have more tables and chairs than they can serve. They weren’t able to anticipate the crowd of hungry runners. In summary, it was really a fun run after all. One cannot expect run on the whole 3km stretch. With a crowd like that one will be forced to walk at certain points. My sister was not registered but she was able to get away with it. Supposed to be, runners without bibs are to be pulled out off the track. Luckily she wasn’t.